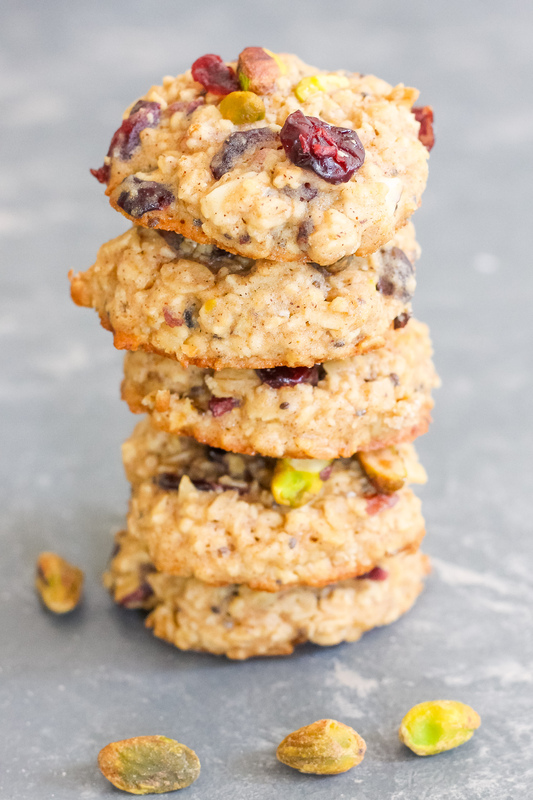 I love Oatmeal Raisin Cookies and when I make them I usually add chopped almonds (check out my recipe HERE) . This time, I ditched the raisins and added dried cranberries and instead of almonds, I added Wonderful Pistachios. The combination of nut and fruit are perfect! I know cookies aren’t exactly referred to be a “healthy” treat or snack. BUT these ones are! These are great for breakfast and a pick-me up afternoon snack when you have a sweet tooth (like me). I usually get my sweet cravings at night so I eat these for dessert! These cookies are sweet, crunchy, chewy and soft. The best part is they are totally healthy! Preheat oven to 350°F. Line two baking sheets with parchment paper or silicone liners. With a hand mixer or stand mixer, beat butter, brown sugar, honey, and maple syrup for 2-3 minutes, until smooth and creamy. Add egg and vanilla and beat to combine. In a separate bowl, combine oats, flour, baking powder, salt and cinnamon. Add the dry ingredients to the wet ingredients and mix until combined. Stir in the pistachios and dried cranberries and mix with a wooden spoon. Scoop the dough into two tablespoon balls or scoop with a mini ice cream scoop and place a couple inches apart on the baking sheets. Lightly press down on the dough balls to flatten just slightly. Bake for 9-11 minutes until the edges of the cookies are done and the center is still slightly underdone. Do not over bake, as they will finish cooking on the baking sheet. Place the baking sheets on wire racks and allow the cookies to cool completely. If you love coconut, add coconut flakes or shredded coconut for a sweeter treat! So why are these cookies healthy for you? 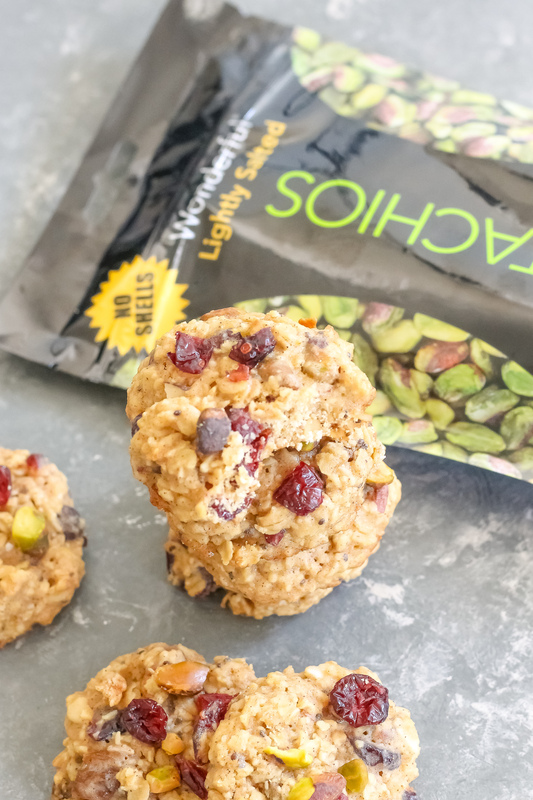 These bites of joy have oats, whole wheat flour, antioxidants, fiber, and the best part all the nutrients from pistachios! According to Wonderful Pistachios, this nut is known as the The Fit Nut. 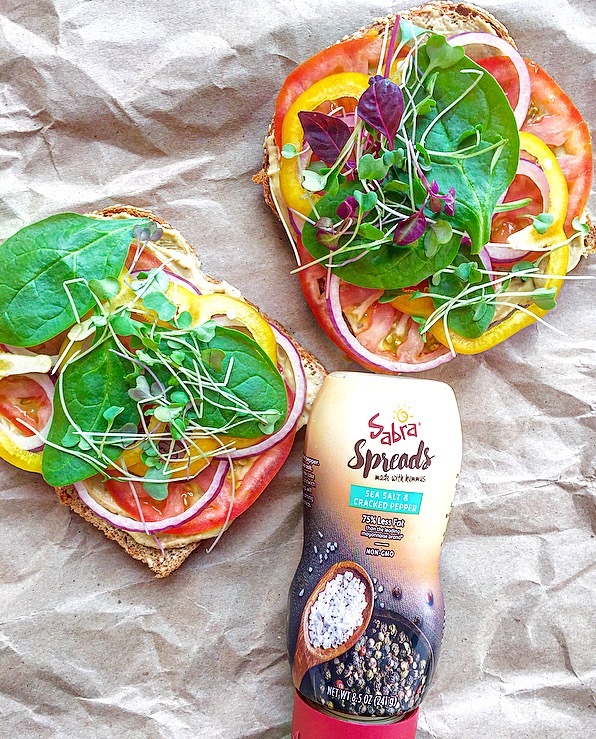 They are loaded with protein and fiber, and are considered a smart snack. 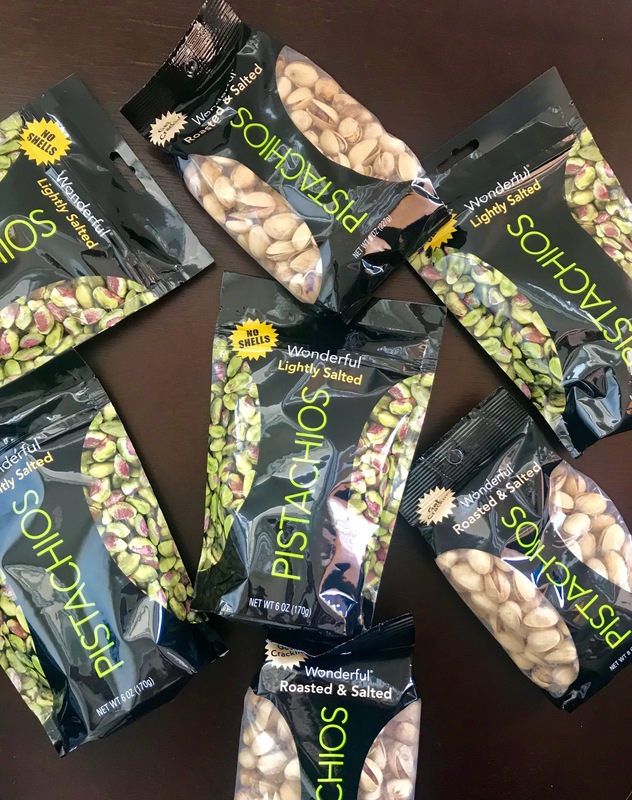 These pistachios are deliciously fulfilling and has the ‘good fat’ that our bodies need. Did you know…The green and red-purple hues in Wonderful Pistachios come from antioxidants. So treat yourself to nutritious pistachios. These nuts are full of nutrients and minerals and are good for your overall health so get crackin’! These cookies will appear to be a little under-cooked when you first take them out of the oven but I promise, they will bake for a little longer once they get taken out of the oven. I prefer my Oatmeal cookies to be on the soft and chewy side. They are even chewier with the bits of dried cranberries and then don’t forget about the crunchy pistachio pieces!